Justice Rohinton Fali Nariman, in his concurring judgment in Joseph Shine vs. Union of India, has declared that Section 497 of the Indian Penal Code, 1860 and Section 198 of the Code of Criminal Procedure, 1973 are violative of Articles 14, 15(1), and 21 of the Constitution of India. Justice Nariman observed that marital stability is not the object for which this provision penalising adultery was enacted. He rejected the Central government’s argument that it is intended to protect and preserve the sanctity of marriage. He has further held that Section 497 is all about proprietary interest of a married man in his wife; and it demeans or degrades the status of a woman by likening her to a chattel. Justice Nariman starts his judgment by making a distinction between offences of adultery and bigamy (Section 494.) He takes note that the offence of bigamy is punishable with a longer jail term than adultery. “It will be noticed that the crime of adultery punishes only a third-party male offender as against the crime of bigamy, which punishes the bigamist, be it a man or a woman. What is therefore punished as “adultery” is not “adultery” per se but the proprietary interest of a married man in his wife,” he observed. Taking note of instances from texts of Judaism, Christianity, Islam and Hinduism Justice Nariman observes that almost all ancient religions/civilizations punished the sin of adultery. He also notes that it continues to be a criminal offence in Afghanistan, Bangladesh, Indonesia, Iran, Maldives, Nepal, Pakistan, Philippines, the United Arab Emirates, some states of the United States of America, Algeria, Democratic Republic of Congo, Egypt, Morocco, and some parts of Nigeria. In this judgment, the Supreme Court through Justice Vivian Bose had held that the last part of Section 497, which states that the wife shall not be punishable as an abettor of the offence of adultery, does not offend Articles 14 and 15 in view of the saving provision contained in Article 15(3), being a special provision made in favour of women. Justice Nariman terms this logic is an instance of ‘Homer nodding’. He disagrees with the application of Article 15(3), (nothing in this article shall prevent the State from making a special provision for women, to Section 497 IPC, which is an ‘existing law’). The judge also observes that the ratio in Yusuf Abdul Aziz does not extend to upholding the entirety of the provision or referring to any of the arguments made before us for striking down the provision as a whole. Justice Nariman also takes note of judgment (impugned judgment in Yusuf Abdul Aziz) rendered by the then Bombay High Court Chief Justice Chagla who had stated that since the underlying idea of Section 497 is that wives are properties of their husbands, Section 497 should not find a place in any modern Code of law, and is an argument in favour of doing away with Section 497 altogether. “The day has long since arrived when the Section does, in fact, need to be done away with altogether, and is being done away with altogether,” he remarks. Justice Nariman then, addressing the argument put forth by the Central government that the adultery provision has relevance, observes that the ostensible object of Section 497 to protect and preserve the sanctity of marriage, is not in fact the object of Section 497 at all. Referring to observations made in privacy judgment, Justice Nariman also observes that the dignity of the individual, which is spoken of in the Preamble to the Constitution of India, is a facet of Article 21 of the Constitution. “A statutory provision belonging to the hoary past which demeans or degrades the status of a woman obviously falls foul of modern constitutional doctrine and must be struck down on this ground also,” he says. 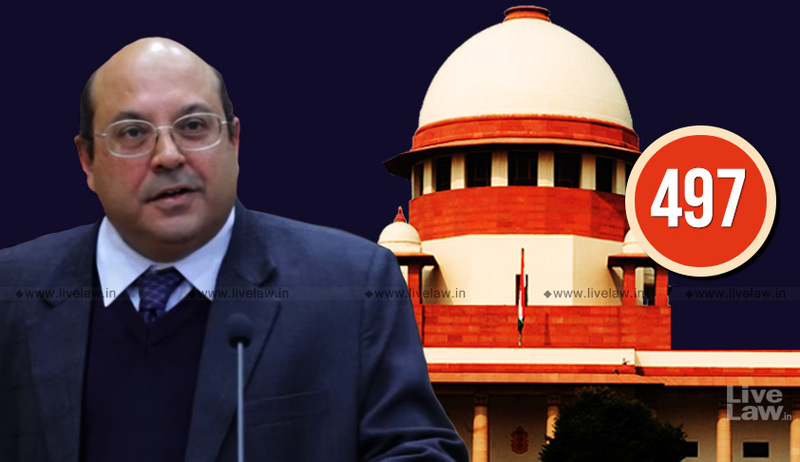 Justice Nariman also finds fault with Section 198 CrPC, which states that it is the husband alone or somebody on his behalf who can file a complaint against another man for this offence.